Lawyers and members of the deceased man's family were in court waiting for Justice Errol Thomas to begin the hearing. But to their surprise there was a delay in the judicial review murder case of five police officers who have been arrested and charged with the murder of Joshua Etienne who died while in police cells at Portsmouth. 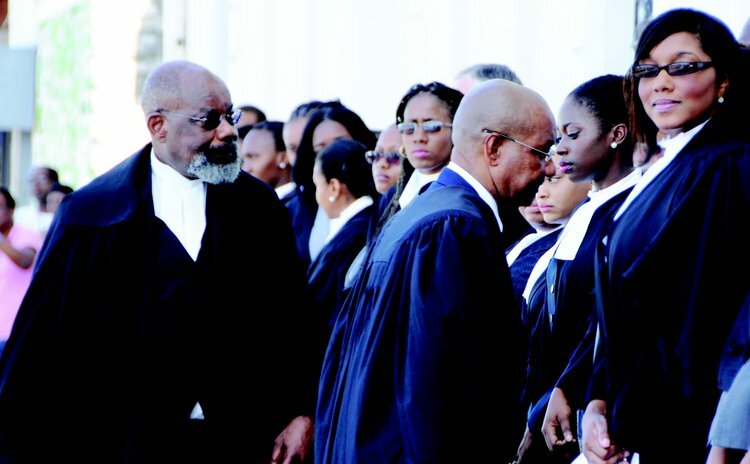 Just about a month ago, on 26th August 2014, Justice Errol Thomas granted leave for judicial review and gave the defence and prosecution specific dates by which they should file affidavits in support of their case. The hearing was scheduled for September 24th. However, when the matter came up, Lennox Lawrence who is leading the legal team for four of the five police officers told the court that the State had filed and served on his chambers additional affidavits outside of the time stipulated by the court and if they had to deal with it then the entire process would be "further delayed". He told the court that he was disturbed and taken by surprise at that and it appeared that the State was attacking "the form." But in his rebuttal Attorney General Levi Peter, who is leading the defense on behalf of the State, disagreed saying that "much of what the applicants had filed in their affidavits was hearsay, irrelevant and scandalous". "The respondents have not acted improperly and are not attacking the claim form...all we have done is address the matter as best as we can," he said. He told the court that both parties could come together to deal with the matter. The court agreed and praised him for his idea and allowed both parties 20 minutes to dialogue but on their return they remained deadlock. "This is a matter of public importance; let's get on the way," Justice Thomas said as he warned both parties that "time was of the essence" and the court's calendar was limited. He then set September 26 for the applicants to file affidavits and September 29 for the respondents to reply. Both parties must also file and exchange written submissions on September 29th. The hearing is set for September 30th at 10am. "Let's come on the 30th with vigour to get it done," Justice Thomas said.